As an architect I’m generally obsessive about three things; patterns, principles and practices. I could probably add to this list but I also prefer to keep things simple. This post is concerned with the first P, Patterns – in the integration architecture context. At what level should they be defined and applied? 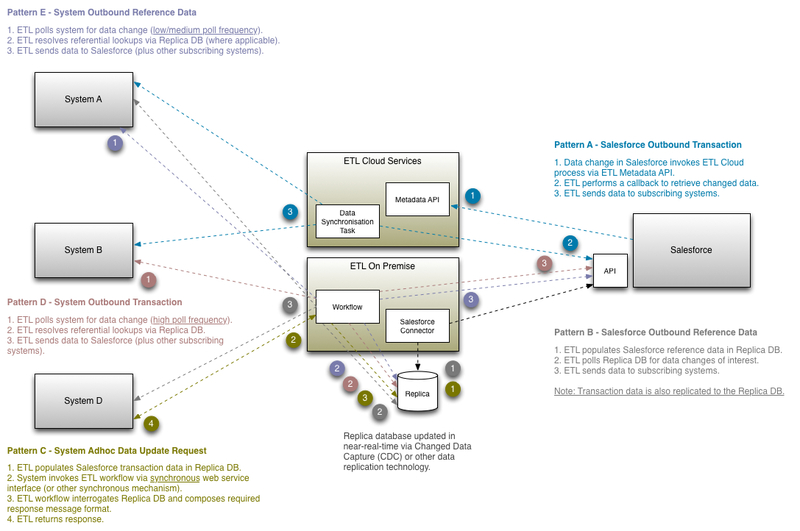 I tend to consider the logical and physical aspects of data integration flows independently. In the logical case, the focus should be on the definition of an end-to-end business process that spans multiple systems. There should be no technology constraint or perspective applied to the logical view. In the physical case, the logical view should be considered an input, and a technical view defined in full consideration of the following. Each physical integration flow definition should not be entirely independent, instead groupings should be identified and robust integration patterns designed and documented. The solution components for each pattern would then be developed, tested and re-applied wherever possible. The schematic below provides a fictitious example of this approach. Having a simple set of clearly defined patterns visible to the project team is key, and should be complemented by a project principle that new approaches to physical integration are by exception – nobody has discretion to be creative in this regard. Standardisation is good practice; integration is expensive in terms of technology, implementation time, run cost and maintenance.